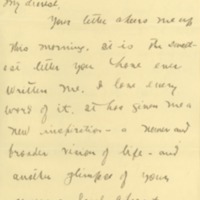 Cary T. Grayson writes about his love to his fiancée, Alice Gertrude Gordon. Your letter cheers me up this morning. It is the sweetest letter you have ever written me. I love every word of it. It has given me a new inspiration—a newer and broader vision of life—and another glimpse of your generous lovely character. Here is the picture of the cottage at Elberon. I think it will be very cozy—and we will be happy in it, and the happiness is bound to last, for I love you, and the love is so all yours, so unselfish for you, that I face the future almost certain that you will be happy. Grayson, Cary T. (Cary Travers), 1878-1938, “Cary T. Grayson to Alice Gertrude Gordon Grayson,” 1916 February 7, WWP20951, Cary T. Grayson Papers, Woodrow Wilson Presidential Library & Museum, Staunton, Virginia.